Bacteria are prokaryotes, with relatively simple cells commonly only a few micrometres in size. The DNA usually consists of a single main chromosome and often smaller plasmids, contained directly in the cell and replicated during binary fission. Some have internal vesicles but there are no more complex organelles as in eukaryotes, and most occur as single cells or simple colonies. Many bacteria have a peptidoglycan cell wall and a lipopolysaccharide outer membrane, though some groups are exceptions. Motile kinds variously have flagella or glide by secreting material. Much more than structural diversity, though, they have a tremendous range in metabolism, variously depending on photosynthesis, organic food, inorganic sources of energy, or switching between them. Chloroflexi take the form of filaments without outer membranes, capable of moving by gliding. They are usually chemoorganotrophs in aerobic conditions, but most also grow as anaerobic photoheterotrophs. These types make up the Chloroflexaceae, generally called green filamentous bacteria though a few are orange to red. Some kinds produce sulfur but not oxygen. Most have bacteriochlorophylls c or d as the main light gathering pigments, contained in vesicles called chlorosomes. These are actually mixtures of related phytochlorins. Chloroflexus aurantiacus for instance has mainly 31R-[8-E,12-M]-BChl cS, a stearol ester, but also the 31S isomer and some with other alcohol side-chains, especially in response to high-intensity light. The accessory pigments are γ- and β-carotene inside chlorosomes and carotenoid glycosides outside them. In light C. aurantiacus produce fatty acid esters of OH-γ-carotene glucoside, and in dark echinenone and keto-myxocoxanthin glucoside. The last and its esters are also typical of orange species, which lack chlorosomes, as well as some other groups like myxobacteria. Cyanobacteria are photoautotrophic bacteria that produce oxygen, assimilating carbon from CO2 using water as a hydrogen source. They vary from single cells to branching filaments, and some are capable of gliding or have specialized cells for nitrogen fixation. They occur in all sorts of aquatic habitats, and some are terrestrial or symbiotic in plants, chromists, fungi, or animals. In most genera the main light-gathering pigments are bluish-green chlorophyll a and phycobiliproteins. The latter occur in aggregates on the inner membrane and are coloured by bilin groups, notably phycocyanobilin in blue and phycoerythrobilin in red types, which differ in two bonds. These are attached to cysteine residues by opening the double bonds at the ends. The main carotenoids are usually β-carotene, echinenone, often zeaxanthin, and myxoxanthophylls; the last are combinations of myxol and deoxy sugar residues as 2′-glycosides. These are mainly protective. Many kinds from mats and soils also have pigments in external sheaths, most commonly yellow-brown scytonemin, which serves as a sunscreen absorbing most UVA radiation. Sphingobacteria are mainly united based on genetic trees. Flagella are only present in a few organotrophic kinds, and most are either non-motile or move by gliding. Some more unusual lipid types like sphingolipids or sulfonolipids, associated with such movement, are also relatively common in certain orders. Chlorobiales, the green sulfur bacteria, are photoautotrophic bacteria that use sulfide or sulfur to assimilate carbon from CO2, depositing sulfur granules outside the cells as an intermediate. All are strictly anaerobic. They occur as either single cells, sometimes irregularly-shaped, or aggregates. Different species are coloured green or brown. The primary light-gathering pigments are bacteriochlorophylls c, d, or e contained in chlorosomes, similar to filamentous green bacteria. Here these occur mainly as farnesol esters and have varying numbers of extra carbon atoms. Chlorobium tepidum for instance contains 31R-[8-E,12-E]-BChl cF along with smaller amounts that have propyl or isopropyl groups. The main accessory pigments are carotenoids with one or two aromatic rings, depending on the bacteriochlorophyll. Green species have BChl c or d, which lacks the methyl on the main ring, and chlorobactene. Brown species have BChl e, a unique type with a carbonyl group as in chlorophyll b, and get their colour from isorenieratene, also found in actinobacteria. Proteobacteria are the most diverse group of bacteria; they are united based on genetic trees, but aside from a thin cell wall and outer membrane without some of the pecularities of related groups, there is little they all have in common. Many have polar or peritrichous flagella, but some are non-motile or gliding, and a very wide range of metabolic types are represented here. Photosynthesis is found in a number of separate families, called purple bacteria. This usually only occurs under anaerobic conditions, though there are also some aerobic chemoorganotrophs that use it to supplement their energy. None produce oxygen, and in most bacteriochlorophyll aP is the only type present. 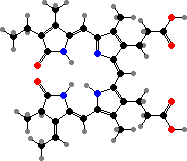 A few have BChl b, which has an extra double bond, or other related forms. The other light-gathering pigments are usually acyclic carotenoids. The most common are spirilloxanthin, which gives them a reddish colour, or else its precursors like lycopene and rhodopin, which colour them brownish. Some other aerobic proteobacteria also accumulate carotenoids, but these are usually cyclic types like zeaxanthin, astaxanthin, and their glycosides. Myxococcales, the myxobacteria, are aerobic rods that move by gliding. They feed on complex organic compounds and most prey on other microbes in soil and decomposing matter, where enzymes are concentrated by swarming. When nutrients are depleted the cells aggregate and differentiate to produce characteristic fruiting bodies, inside of which they form resistant spores. Most cell masses appear yellow to red from protective carotenoids, especially in response to light. These are mainly monocyclic types more like in other gliding bacteria than proteobacteria, for instance keto-myxocoxanthin glucoside or myxobactone, which occurs as fatty acid esters in Myxococcus and related genera. Xanthomonadales include one family of strictly aerobic rods, relying on oxygen for respiration and mostly unable to reduce nitrate. Gliding is found in long and flexible Lysobacter, which like myxobacteria break down other microbes, but the others are non-motile or have usually one polar flagellum. Many types have coloured colonies; in particular esters of yellow xanthomonadins, a group of brominated polyenes, are characteristic of most Xanthomonas including many plant pathogens causing leaf spots, cankers, and so on. A red phenazine, myxin, is one of various antibiotics found in Lysobacter and has been used to treat fungal skin infections in animals. Chromatiales mainly include the purple sulfur bacteria. These are photoautotrophic in anaerobic conditions, and some are also capable of aerobic chemolithotrophic growth. In both cases they oxidize sulfide, forming sulfur globules as an intermediate, usually inside the cells. They occur as single cells or aggregates, found in a variety of aquatic habitats with both light and sulfide. Most kinds have acyclic carotenoids like spirilloxanthin, but species in several genera produce okenone instead, which has an unusual aromatic end group. When present this is the only major carotenoid, colouring them purple-red, and so gives an advantage gathering light in habitats like deep water. Pseudomonadales include two chemoorganotrophic families that mainly rely on aerobic respiration. Most are rod-shaped, with polar and lateral flagella variously present or absent. They play an important role in breaking down many compounds including mineral oils, and many are symbiotic or pathogenic in plants and animals. Pseudomonas from soil are often associated with plant roots and some benefit them by suppressing other microbes. Many of these form fluorescent cultures owing to pyoverdins, where a quinoline chromophore is combined with a peptide chain. These are yellow-green siderophores released to secure iron ions for uptake by the cells. A number of different antibiotics occur in this group. For instance pyrrolnitrin and 2,4-diacetylphloroglucinol, both toxic to many fungi, and pyoluteorin, which inhibits water molds, are all found in P. fluorescens among others, used as a biological control for plant diseases. Mupirocin, a topical treatment for staphylococcus infections, also comes from this species. Many also have phenazine pigments, which cause oxidative damage to a variety of organisms. Pyocyanin is characteristic of most P. aeruginosa, opportunistic pathogens in for instance burns, and gives infections a blue-green discolouration. These also share orange oxychlororaphin and its matching acid with other species; a green reduced form is typical of some P. chlororaphis. Alteromonadales include one family of chemoorganotrophs, some only capable of aerobic respiration and others also able to reduce nitrates. The cells are straight or curved rods, typically with one polar flagellum in motile kinds. Most are found in marine habitats and require sodium for growth. Pseudoalteromonas produce many protective compounds. Some form biofilms on seaweeds or sessile animals that inhibit other fouling organisms; these have antimicrobial peptides and often purple violacein, found in various proteobacteria and toxic to grazing protozoans. P. luteoviolacea also have halogenated antibacterials like pentabromopseudilin. P. tunicata have both violacein and yellow tambjamine YP1, an antifungal compound related to pigments in bryozoa and sea squirts, as well as to red prodiginines like cycloprodigiosin in P. rubra. Another antifungal, isatin, occurs in P. issachenkonii on algae and an uncertain species on palaemonid shrimp eggs, where it has been found necessary for their survival. Still other species produce tetrodotoxin, including P. tetraodonis and Shewanella algae from marine pufferfish. This is a strong neurotoxin that blocks sodium uptake by neurons, and while the meat from these fish is sometimes eaten for the tingling sensation caused by minute traces, if the parts storing the toxin are not carefully removed it causes fatal respiratory failure. Tetrodotoxin or its epimers are also reported in some other proteobacteria like certain Vibrio, and as taken up by a wide variety of marine animals: as defenses in pufferfish, gobies, crabs, snails, and certain worms, and in the predatory arrowworms and blue-ringed octopuses as venoms. They are also found in some terrestrial newts and frogs. Endobacteria have no outer membrane and usually a thickened cell wall, recognized by a positive Gram stain, or in the case of mollicutes none at all. In contrast to Actinobacteria they typically have DNA with low G+C content, and many kinds produce endospores, special heat-resistant stages formed inside ordinary cells. Most kinds are aerobic to anaerobic chemoorganotrophs, and some are found in other living things, including all mollicutes. There is also photosynthesis in one family, the Heliobacteriaceae, brown-green anaerobes found mainly in soil. In these the cell wall is relatively thin and so stains negative, but even so there is a single membrane and most form endospores. The light-gathering pigment here is the unique bacteriochlorophyll g, which is also the main pigment in reaction centres. This is similar to chlorophyll a, but differs in one double bond and only occurs as a farnesol ester. C20 terpenes are not produced at all, and so the accessory pigments are only C30 carotenoids, mainly 4,4′-diaponeurosporene or derivatives. Most pigments in aerobic species are also carotenoids of this type. Staphyloxanthin is notable as a defense in Staphylococcus aureus causing a variety of skin and tissue infections, including some notorious for antibiotic resistance, as it helps golden-yellow strains resist oxidative attacks by the immune system. This is a fatty acid ester of the diaponeurosporenoate shown here. 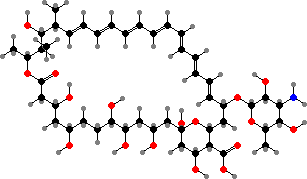 Actinobacteria typically have a thick cell wall with either no outer membrane, or in some a unique type containing mycolic acid. Most have DNA with high G+C content and are largely aerobic. They vary from cocci and irregular rods to branching filaments called hyphae, often with differentiated substrate and aerial hyphae or sporangia somewhat like in molds. Many kinds accumulate carotenoid pigments, which give colonies colours from yellow to rose. The most widespread are regular carotenoids like β-carotene and canthaxanthin, isorenieratene and others with aromatic rings, and extended C50 derivatives like decaprenoxanthin and its glycosides. The last class seem peculiar to these and archaebacteria. Streptomycetales include one family that form extensively branched and non-fragmenting hyphae. Spores are ultimately produced in chains on aerial filaments, either at the ends or in whorls, and occasionally on substrate filaments as well. They are aerobic and primarily terrestrial, common in soil and litter, with a few pathogens of mainly plants. Streptomyces produce a great variety of antibiotics and have been their leading source for clinical use after penicillin. These began with streptomycin from S. griseus, the first treatment of mycobacterial infections like tuberculosis. Several other aminoglycosides have been important against mainly proteobacteria, for example kanamycins from S. kanamyceticus. Broader spectrum antibiotics include chloramphenicol from S. venezuelae, with use limited by high toxicity, and yellow tetracyclines like chlortetracycline from S. aureofaciens. All these interfere with bacterial ribosomes. Among others, daunorubicin from S. peucetius is used against leukemia, and macrolides like amphotericin B from S. nodosus against various fungi. Some insects also benefit from actinobacterial compounds, and in fungus-growers they can be key in maintaining cultivation against competing fungi. Among leaf-cutter ants some Acromyrmex have streptomycetes producing candicidin with this effect. Likewise mycangimycin was found in a strain from some Dendroctonus pine beetles, which carry fungi into trees they attack. Archaebacteria are set apart by having a single cell membrane composed of unique ether lipids, rather than esters as in other groups, and many live in conditions where those would not be stable like very high temperature or acidic water. Most have cell walls but no peptidoglycan, and flagella when present are also a unique type that grows at the base rather than the tip. These are the closest relatives of eukaryotes, sharing a number of genetic features. They are often considered separate from the bacteria as the Archaea, though this generally presumes the others all form a single lineage in their absence, while there is reason to think the Gram-positive lineages are also closer related to them. Halobacteriales, the halobacteria, are found in hypersaline habitats such as salt lakes, spoiled salted meats, and salterns. These are typically aerobic and chemoorganotrophic, but many can also use energy from light or conduct anaerobic respiration. They variously take the form of cocci, rods, or irregular cells, and with few exceptions are coloured bright red. The main pigments are the C50 carotenoid bacterioruberin and its derivatives. Besides these, cells have purple bacteriorhodopsin and other membrane proteins with retinal groups, involved in both detecting light and absorbing its energy. This involves pumping ions in or out of the cells to maintain a potential, rather than electron transport as happens with phyto- or bacteriochlorins.